Never fumble for your keys to unlock your door again! 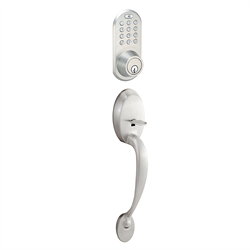 This 3-in-1 lock allows access by the included RF keyfob, numeric codes, or using a regular key. The keypad can be temporarily lit to make it easy to use in the dark. This convenient lock is similar to those found in high-security applications in office buildings and institutional facilities yet can be easily installed at home by anyone who knows how to use a screwdriver. The lock uses 4 AA batteries (sold separately) which provide power for up to 18,000 successful applications per set of batteries. Not recommended for metal/steel doors as RF range will be dramatically reduced unless a gasket can be installed. No gaskets are available from the manufacturer, however.